You are here: Home / Travel / Florida Attractions / Disney / Strollers at Disney World Yay or Nay? 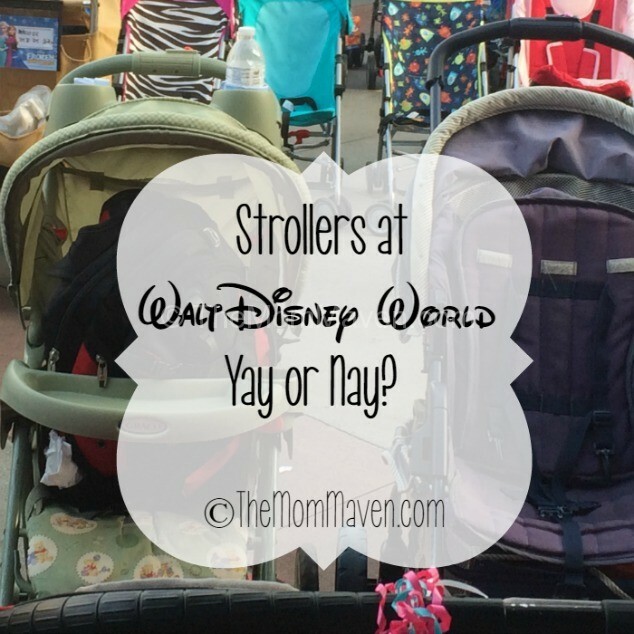 Strollers at Disney World Yay or Nay? If your child is under the age of 3-bring a stroller from home. If your child of any age has a documented medical issue, seen or unseen, this post is not about you or them. I encourage friendly dialog but not nasty comments. I reserve the right to delete hurtful comments or close comments on this post if necessary. This post is a log time coming. If you have ever toured the parks with me you are probably aware of my disdain for the over abundance of strollers at Disney World. Yes, I am a mom and yes I have toured the parks with children in strollers. The opinions and information I am sharing here is how we handled strollers when our boys were young-and how I wish more parents would consider their stroller use at Walt Disney World. You spend more time parking strollers than the children do riding in them. Stroller parking isn’t outside each ride or attraction like it was in the old days. Now it is often in a large area by land or section of the park. You still have to walk from attraction to attraction without the stroller. Parents pushing strollers are often too distracted by their surroundings to talk with their child or pay attention to the guest in front of them whose ankle they just rolled up on. Ouch! Kids in strollers are too close to the ground to enjoy all of the beautiful sights and sounds around them. All they can see are legs. Strollers end up full of stuff and not kids! Often 2/3 of the strollers at Disney World are filled with stuff people are lugging around the park and not the kids they were intended for. Kids who walk expend energy and are less fidgety while standing in line. Kids who walk sleep better when they return to the hotel because they have exercised during the day. Kids who walk eat better at meal times because they are burning calories throughout the day. Prolonged Walking-No child or adult is ready for all of the walking required of a Disney vacation. Before your Disney vacation planning begins, start training your child and yourself for extended walks. You can walk in your neighborhood or mall. Start small, work up to a half-day outing and finally a full day at a zoo or aquarium. Hold Hands-From the first time your child walks with you in public teach them to hold hands with an adult. If they learn this from the beginning it isn’t difficult to do in the parks. The 8yo we often travel with still holds hands with one of the adults as we walk through the parks. Safety is important. Using a child leash is ok-but not if the parks are very crowded. I have seen more than one guest get tripped because they weren’t paying attention and walked between a child on a leash and the parent on the other end. Breaks are Good not Punishment-Take breaks when needed. Sit on a bench, have a snack, people watch or enjoy the scenery. What to Carry-Only pack essentials in your backpack diaper bag. You don’t need to lug every toy the child owns. Stay on Schedule-Don’t skip nap schedules on vacation. Go back to the resort and enjoy nap time. The atttractions will all be there when you return and everyone will be happier because they got some rest. Carry Your Child-Occasionally carry your child between attractions. The bond shared between a parent and child when they are being carried is an amazing thing. When Aaron was 2 years old we visited the National Aquarium in Baltimore. We had his umbrella stroller with us. When we entered the aquarium they checked our stroller and loaned us a back child carrier, it was genius! They still do this today, almost 20 years later. They do it for a few reasons-the higher vantage point allows the child to see more of the exhibits, it is safer than allowing strollers on escalators and moving sidewalks. For years I have wished that Disney would encourage this same practice. I dream of a visit to Walt Disney World that isn’t cluttered by parked strollers and where I don’t get rammed by multiple strollers during my trip. Yes, it may sound selfish, but it is my vacation too and just once I’d like to return home without cuts on the backs of my ankles. What is your opinion? 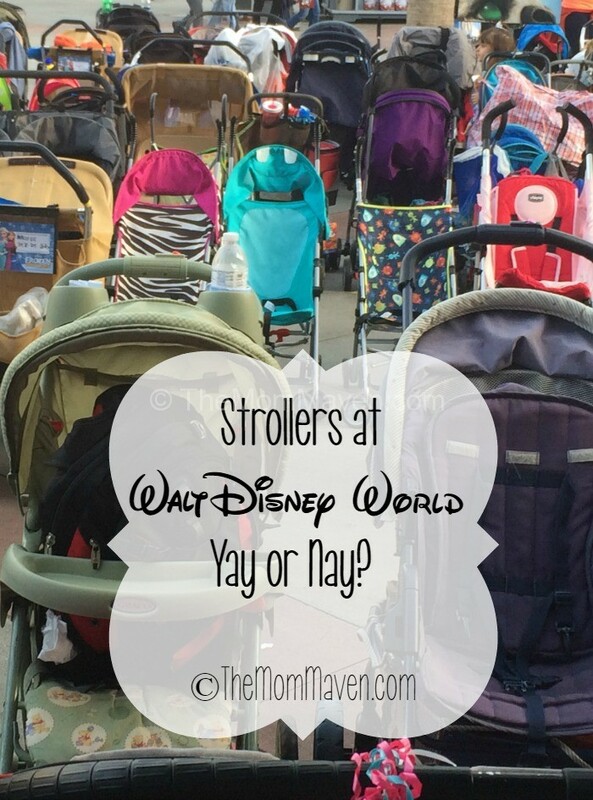 Strollers at #Disney yay or nay? Gee, what a concept! No strollers at Disney!! Children walking!! Parents holding children! Love it! As a short person. myself, I totally get the ‘all they can see are legs’. Let’s all get together and have a ‘Stroller Free Day’ I can see it now. Kids enjoying themselves! Parents might get to like the idea. I agree IF you have an older child. However, with a baby it is practical. However, however – I would personally refrain from taking a super small child to Disney for extended periods of time. We’re making our first trip with our youngest this year now that he is 4 and we’ve been working with him on walking longer distances. I’ve done the stroller thing at some local amusement parks and don’t think I would want to give it a try at Disney. Hi Jeannette, the youngest child we have taken was just over a year old and we had a great time! We didn’t have many problems with the stroller and it was nice because she would nap in it and I could just stroll around. There was a lot of in and out of the stroller which can be time consuming. I have seen some parents with infants in baby slings and carriers, I think that would be a great way to go when they are that small! Love this!! I think once kids are 2 or 3 no need for them to be in a stroller the whole time. Thanks, Michelle-I agree. Walking is good for them. I was totally going to say that this is why we will be using a toddler carrier when we go later this year, but your comment about the Baltimore Aquarium beat me to it! We have three strollers, but it is such a pain to take them places now that the kids are older. Toddler Tula all the way! Thanks, Holly. Have a great trip! I love this post! My husband and I have been having the stroller debate. We have been to Disney 5 times and have always taken our sit-n-stand stroller and I have always loved it. I agree that you do end up parking it and walking to a lot of places and then back tracking to find the stroller at times, but I still have always been glad we had it. I loved during park opening or after parades when the crowds are crazy we would have one in the front, one sitting on the bench seat, and the other standing next to them. My husband and I could walk right next to each other and all three girls were secure and safe. However, the last trip was in August and our youngest was 2. The next trip we are planning our girls will be 9, 6, and 4. Falling asleep in the stroller will be a thing of the past (and we totally agree with taking breaks and going back to the hotel in the middle of the day). So we are now debating do we bring an umbrella stroller or just bring a backpack?? Loading the bus with no stroller would be amazing!! Stephanie, getting on all Disney transportation without a stroller is amazing! Being a Florida native for 46 years, I have been to Disney more times than I can count. As a mom of 7, for many years we always had a baby or young toddler and a stroller was a must. One of my children suffered from terrible leg pains and, even at age 8, at times he would take the baby’s place in the stroller. I agree parking and retrieving the stroller could be frustrating at times, but worth it. I personally loved having a place to put things such as water bottles or souvenirs, especially with so many people. However, when my youngest turned 4 years old, I was thrilled to not have to lug the stroller to theme parks anymore. My children now know that if they want to buy something early in the day, they are going to have to carry it around (There are lockers for storing items. I’ve not found them convenient.). But I’d like to comment on some of your points. Not everyone can afford to stay in a resort or even a nearby hotel, so leaving for a nap is not reasonable. Being less than 2 hours from Disney, we rarely even stay overnight, and I know that we are not alone in that. Also, the vast majority of people, even Florida residents, do not have annual passes and to take time to leave for the hotel means valuable time not seeing and experiencing the park. At $100 a person, that’s an expensive nap! It’s impossible to see an entire park in a day, and taking time to go back to the hotel for a few hours makes that $100 not worth it at all. We enjoy seeing the parks at a leisurely pace now because we do have annual passes, but we were not always in a position to afford them. None of my 7 children have ever said to me, “I enjoy Disney much more now that I’m not in a stroller.” My toddlers have thoroughly enjoyed visiting Disney parks even from their stroller vantage points. They saw much more than legs. I know this because of all the sights they described to me for weeks and months after each trip. Not every adult is able to carry a child in a pack for physical reasons, and not can every young child can walk so much. As you pointed out, many disabilities are unseen. So, I would hate to pass judgement on what I may not be aware of or understand. Even without disability, I am of the belief that parents have a right to choose the way they and their children travel and experience Disney. Only parents know what is best for their own family. I make many parenting choices that are not the norm, and I do not appreciate judgement… to each his own. Finally, in 46 years of Disney visits, I have never been hit by a stroller… ever, nor have I ever run into anyone with mine… ever. Rebecca, Thanks for your input I appreciate you taking the time to share it. I was not judging at all just sharing my experience and asking others for theirs. I cannot believe that you have managed to avoid being hit by a stroller in all those years of Disney visits that is an amazing feat! Thanks, cindy for sharing this article. As a Disney lover, Mom and past experience I think the stroller is very necessary for Disney world trips. As a mom, my advice is you should not only take the stroller but also you should choose the best one for this trip. But parents obviously follow the Disney park rules about the stroller. Donna, We each have our own opinions. I agree babies should be in a stroller. Over age 4 they aren’t necessary.